Vanishing Inc describes Denis Behr as "Denis Behr is a superb card magician--one of the world's finest by any measure. He exhibits extraordinary skill, creativity, and humor, packaged in a uniquely German character." 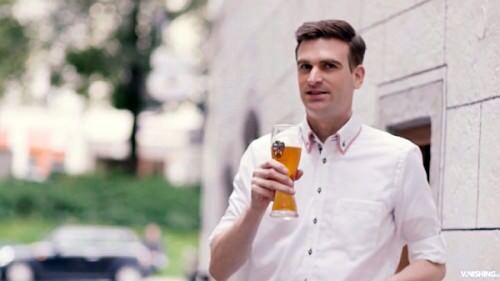 I was unfamiliar with Denis work, but having watched his incredible new video, Magic on Tap, I'm now a Denis Behr fan. In this set of four DVD length videos, we get to watch Denis perform an entire show more than an hour long, enjoy him explain these routines carefully with another three hours of instruction, and finally spend another hour with him in a beer hall where he performs and teaches even more effects. It's brilliant stuff, and an opportunity to see one of the finest magicians in action. I first came across Denis Behr as a result of his amazing conjuring archive (link), an online project that started in 2004, which carefully lists and categorizes the contents of many magic books. It's tremendously helpful, and is a fine example of the kind of careful attention that magicians like to give when crediting and documenting the history of effects and resources. What I didn't realize until recently, is that Denis Behr isn't just a magician skilled as a digital librarian, but is also supremely gifted and applauded for his remarkable technical skill with cards. He's gained a reputation for "highly technical, smart card magic", and some consider him "the finest card technician of his generation." He's extremely talented, not just as a performer, but as very clever thinker. Some of his online videos proved to put him in the spotlight, but Denis has contributed as a teacher of magic in several ways, including as the author of two small books, Handcrafted Card Magic (2007) and Handcrafted Card Magic Volume 2 (2011). But now there's his most impressive work yet, Magic on Tap, a series of videos available as a DVD or as a digital download. You get more than five hours of material here, so it doesn't come cheap. For $75, you get four DVDs, or instant digital downloads of the videos in four sets of videos. I got the video from Vanishing Inc Magic, where it is available here as an exclusive. I opted to go with the high definition videos via digital download, and found myself with almost 8GB of videos, as well as a carefully organized PDF document with a Table of Contents that lists all the effects and the exact time on each video where each can be found. For me the highlight of the entire video is the fabulous routine, Herbert The Trained Rubber Band. This trick is an absolute must see! Fortunately you can see the full performance of this routine in the video clip below, starting at around 30 seconds here. The DVD set also contains another performance to a different audience, and of course the explanation. But this performance clip will give you a good idea of the creative and clever approach Denis has to his magic, and his ingenuity and ability to entertain. For the opener, a spectator sights a card they stop the magician at in the middle of the deck. Without shuffling, the top card is shown to be an indifferent card and placed in their hands, and magically turns into their chosen card. Comment: This is a very quick routine, but creates stunned reactions from spectators due to the sudden and magical transposition. Four Queens are removed from a deck, a random surprise card placed inside the empty box, after which a spectator freely chooses and remembers a card and returns it to the deck. The four Queens are then shown to all be the spectator's selection, and are quickly returned back to Queens. The mystery card inside the box is then shown to be the four Queens, while the pile of four Queens has vanished and turned into the spectator's card. Comment: This is a very action packed routine, with surprise after surprise, and one transposition after another. It's a superb illustration of Denis' astounding technical skill with cards, as he performs a series of difficult moves flawlessly. Throughout the effect there's also a running gag that Denis is trying to make the spectator forget his card, and this is a beautiful concept that both ensures that the spectator remembers his card, and also gives a good motive for the steady stream of transpositions Denis performs, as an apparent effort to confuse the spectator. It's a great lesson about the importance of motivation in magic. A deck shuffled by the spectator is placed inside the box, which the magician never again touches. 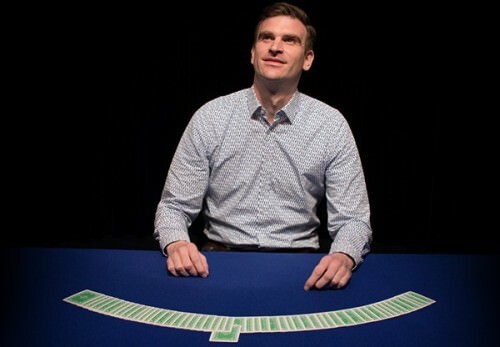 A number between 10 and 40 is chosen an audience member, and a second spectator freely chooses a card from a second deck. Now the first spectator counts down to the chosen number, and the card matches the second spectator's selection. 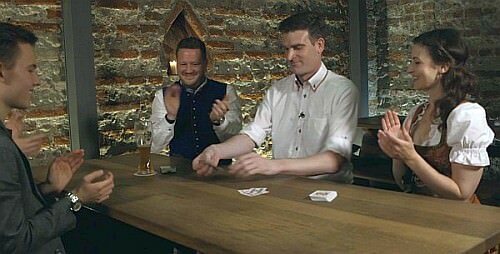 Comment: This trick had a great build up, and there was an enthusiastic round of applause, after some moments of suspense and drama as the cards were counted and the final card shown to be the same as the spectator's selection. There's also a great running gag with this trick is that the magician isn't allowed to touch the deck, and this is also a great idea that provides some entertainment that actually helps emphasize the magical moment. Denis introduces his assistant Herbert (who even has his own Facebook page here), a rubber band that has been trained to find any card. A spectator chooses a card which is then lost visibly in the middle of the deck. The rubber band is then wrapped around the deck, and in an instant the rubber band appears wrapped around a single card in the middle of the deck, which is of course the spectator's selection. 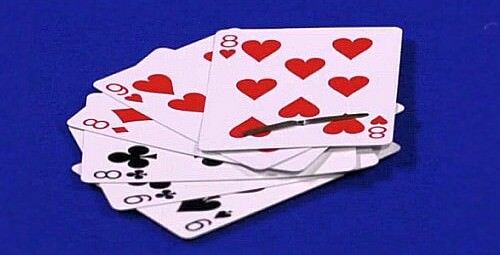 The trick is repeated by making it even difficult: this time a spectator just names any card, and the rubber band is shown to be wrapped around that card. You can see the technique in these video clips here and here. Comment: Once again there's moments of warm humour, for example Herbert is "blindfolded" (by placing him under a spectator's hand) so he can't cheat. 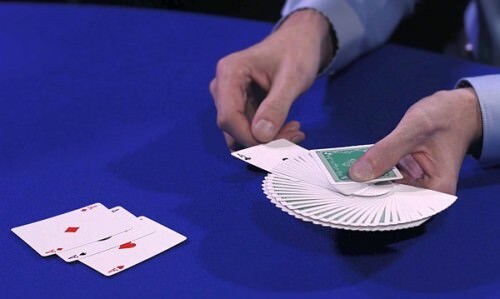 The basic plot for this trick is an old one, as a card is chosen and found, but the techniques are flawless, and the method of revealing the card with a rubber band gives it a whole new lease of life, and wonderfully entertaining. This is a gambling demonstration, to illustrate card control of a single card. In which five cards of Poker are dealt, from which a single card from a single hand is chosen and revealed. Denis then states that he will find the matching mate of that card, making it appear in the same spot with his next deal, which he does. Having illustrated the concept, the difficulty is now ramped up by letting a spectator choose one of five randomly dealt poker hands, and now Denis repeats the effect, first manipulating the deck and then dealing out another five poker hands, with one now having all five mates to the hand chosen by the spectator. The concept is taken further by letting a spectator cut to a card from a shuffled deck, and Denis immediately identifies its mate in the other half of the deck - three times in a row. For the final phase, the deck is shown to be shuffled, and then dealt face up showing that all the cards are now together with their mates. Comment: The presentation here is key, and what really makes this so strong is how the first phase is presented as an apparent exercise of card control. But halfway through the effect Denis says it is actually all luck, and this then becomes the theme for the rest of the routine. This presentational choice helps create a real element of suspense, because each of Denis' choices appears to be a matter of a lucky guess. Each revelation gets a loud round of applause, which testifies to how impressed the audience was with the effect. It's a wonderful routine, with the "mate" concept creating a good thematic unity that ties the phases together, and each phase becoming increasingly impossible so we never get tired of watching - in fact the final revelation rightly received a thunderous applause from an amazed audience, in respect for Denis' skill. Explaining that each card value represents a month of the year, the deck is shuffled by one spectator, while another indicates that his birthday is in November, corresponding to the Jack. Denis then produces the four Jacks from the deck one by one in a series of increasingly impossible maneuvers. Next, he ups the ante for the final phase, with another spectator giving the month of his birthday as October, and Denis promises to produce all four corresponding 10s at once. But there's a real twist at the end - they aren't even in the deck, but the four Jacks previously produced have now turned into the 10s! Comment: This is a truly astonishing routine, based on the common "Cut to the Aces" plot, but ramped up in difficulty and made far more impressive with the help of genuine technical skill and a wonderful presentation and showmanship. It is absolutely gorgeous to watch Denis at work with this routine! Introduced as an experiment in physics, three red and three black spot cards are introduced, the black cards apparently "heavier" due to more ink. Denis then does a beautiful oil and water routine, as the reds and blacks are placed in an alternating order, and automatically separate themselves with the red cards on top. This is repeated multiple times, each with increasingly impossible conditions, including a third phase with a "sleight of hand prevention machine" where the alternating cards are held in order with a pin punched through the cards. In the fourth phase, the entire deck is surprisingly shown to be sorted by colour, and then after a shake all the cards are in alternating order. Comment: The oil and water concept is a classic in card magic, but Denis really offers a beautiful presentation and narrative that makes it entertaining and gripping. And his card work is impeccable as always. It's also a superb example of good magic design, with each phase increasing in intensity and impossibility. So how does one get a new deck into play during a performance? At the end of this routine there's a very natural motive for doing so, which I'll leave you to discover for yourself by watching the video. Denis suggests the humorous notion that when he drinks beer, his memory improves, which he proceeds to demonstrate by memorizing a shuffled deck of cards - with the help of beer. A spectator removes a single card and replaces it elsewhere in the deck, and after a sip of beer and glance at the deck, Denis identifies the card that has been moved. This is then made more difficult when a spectator now removes a card without replacing it in the deck. For the final phase, a spectator takes a photo of the order of a packet of the deck, which is then shuffled after Denis has momentarily glimpsed and "memorized" it, he then reconstructs the entire deck in its original order. Comment: This is a great effect that really emphasizes an apparent ability to memorize an entire deck just by glimpsing it briefly. To make this routine even more convincing, the deck is regularly shuffled and cut between phases, and subtle convincers like this are important. This trick isn't taught on the video but only performed, and Denis plans to release it some time in the future. Warning: don't try this routine at home without knowing how it's done, especially since at one stage Denis downs a massive mug of beer in one go, and despite his assurances, doing this may not improve your performance! A spectator selects a card and returns it from the deck. While the cards are dealt into two piles, Denis explains the rules of a game he invented, he and the spectator each get a pile, and whoever gets the pile with the chosen card is the winner! At first the odds are 50/50, with each having half the deck, but then Denis gives the spectator more and more cards, until he only has one card himself. Comment: This routine is a fine, fine example of what a difference good presentation can make. 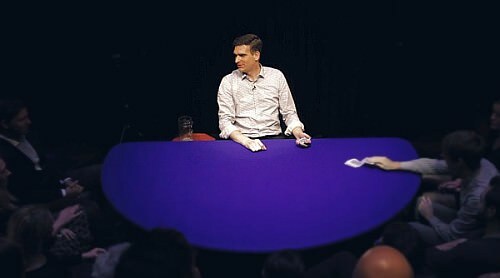 While effectively it's a "pick a card" type trick, where the magician then controls and reveals the selected card, the whole premise of a "game" is highly entertaining, wins over the audience's sympathy for the magician, and creates a presentation that is humorous, suspenseful, and powerful. This is a longer routine, where Denis states he'll demonstrate how poker cheats operate by controlling cards. First he cuts to a four-of-a-kind for any value named by a spectator. Then he shuffles these into the deck, so that they are all dealt to himself. Then he repeats the effect, making it harder, and deals himself a royal flush - in a suit chosen by a spectator, and to the player number also chosen by a spectator. 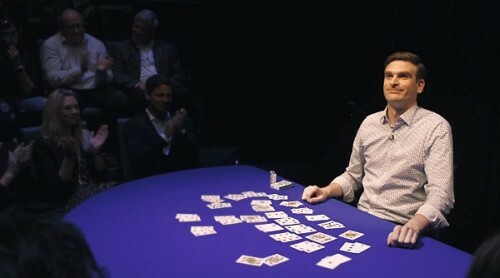 As a finale, he then deals out a full hand for a game of Bridge, producing the entire Hearts suit! Comment: I love how Denis says several times "I'll show you how this works", knowing full well that most people can't possibly remember what he is doing, and certainly not replicate it. It is possible for the audience to follow along in the first phase, which is exactly the point, because then the final phases become all the more credible, and appear to be a result of genuine skill, rather than magic. This kind of presentation reminds me of Sal Piacente's style, and can be very effective in the right context. But this trick is genuinely difficult from a technical point of view, because the spectators get to name the cards that must be dealt and the players who get them when they are dealt. This is a demonstration of predictions. Denis writes down a secret prediction, and from a shuffled deck a spectator turns over cards one at a time until he wants to stop at a card, which turns out to match the written prediction. To confirm the miracle, the effect is repeated twice more, this time with the cards face down, and the spectator given opportunity to change his mind more than once before the final reveal. Comment: This one really impressed me, because the plot is so straight forward, and it truly seems completely impossible, especially because the spectator really has a free choice when they want to stop, and can even change their mind. This triple prediction "stop" trick is performance only, and the explanation can be found in Behr's book Handcrafted Card Magic Vol 2. 1. Another Trick for Allen Kennedy 2: A demonstration of center dealing, that produces the four Aces from the middle of the deck, when dealing the cards from the top. 2. Arith-Mate-ic: A three-phase routine based on a self-working Alex Elmsley idea, where mates are produced by "coincidence" from two piles, at exactly the number corresponding to a packet removed by a spectator. 3. Packet Trick: A lovely routine with a memorized deck, where a missing card from a deck is identified, and then the exact location in the deck of a thought of card is named. 4. Green Card: A variation of the classic ambitious card plot, with a stunning finale when the signed card impossibly ends up turning out to be a prediction card with a different coloured back that was set aside at the start. 5. Plop: A four of a kind named by a spectator is produced from a closed box, through the case! The video footage is outstanding. The video can be downloaded in normal resolution or high resolution, so opted for the larger size files for optimal quality, which looked outstanding on my wide-screen monitor. 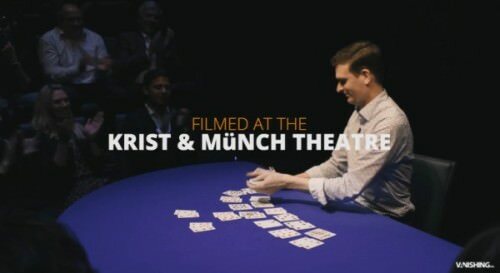 Unlike large scale stage magic, close-up magic can be more difficult to film well, but the filming is of the highest calibre, with cameras showing different angles, and the best possible views of the performance and teaching, with close-ups when necessary. The lighting is also excellent, with the performer clearly and well lit, while the audience melts into the background under appropriately more dim lighting. Interestingly Denis has chosen a somewhat unorthodox deck for most of his performances: a green Bicycle rider-back, although it looks fine against the blue table backdrop. The audience is well-dressed, polite, and provides regular and polite applause at regular intervals, which at times becomes very loud applause at the often stunning finales of his routines. The sound is clear, so that everything Denis has to say comes across very clearly. Denis Behr is the real deal. In his book Designing Miracles, Darwin Ortiz points out that several elements are necessary to produce strong magic, including good design, good technique, and good presentation. Denis is tremendously skilled in all these areas. He also has a charming persona, and I especially appreciate how he gives good and unusual motivations for his abilities - e.g. it's pure physics that causes heavier cards to descend to the bottom, or it's a result of a clear memory from drinking beer; or it's because he is the "inventor" of a game that he has an advantage and so can't lose; or it's because he's studied how poker cheats operate; or it is pure "luck". As a result he comes across humble rather than arrogant, and you feel entertained rather than fooled. Rather than feeling like a frustrating puzzle, the presentation feels like genuine magic. People new to the craft of magic, and even some old hands, would do well to learn from Denis in this regard. While Denis is German, and speaks with a noticeable accent, this never becomes a barrier - he speaks clearly and confidently, and is easy to understand, and he has a genuinely pleasant and warm manner that comes across as a true gentleman. 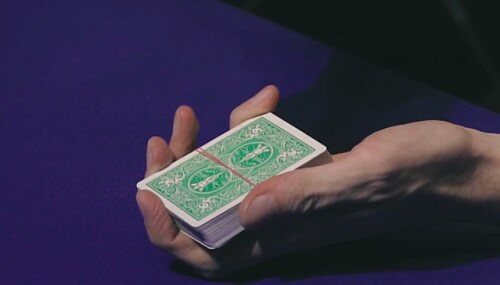 I also really appreciate the variety in techniques he uses, for example, when losing a card in the deck, Denis doesn't resort to the same handling every time (which could otherwise draw attention to itself, or give away the method). But more importantly, his skills with cards are amazing, and it's a real pleasure to see a skilled card-man like him at work. There's a lot of material here, and the teaching material alone includes 16 full routines. Note that two of 11 effects from the theatre performance video aren't taught in the explanation videos (Photographic Memory and the wonderful encore Stop It). However the teaching section does have a bonus effect called Messy, which is a stunning Triumph style routine, and there are 5 more effects taught in the beer hall video. Herbert The Trained Rubber Band is easily one of the highlights, as is the beautiful Oil & Water routine. Each of the tricks has its own development and build-up, and is easily the kind of thing that working pros could fit into a professional show. They are all strong routines, that are well constructed, typically consisting of several phases, each more impossible than the last. They are a fine example of the principles underlying good magic construction, and illustrate what well designed magic effects should look like. They're also very strong, and the audience's reactions speak for themselves. I also appreciate the variety in effects, and there's different kinds of presentational ideas that Denis uses, which means that most performers should find something here that will suit their style. This is not material that the beginner magician will be able to learn and perform, and many of the tricks do require very good card skills, including some use of memorized decks, and consistent faro shuffles. But that doesn't mean that this material isn't of any benefit to those who aren't yet at an advanced level with cards. First of all, there's the sheer pleasure of watching a skilled performer at the top of his game, performing some true miracles with cards. Secondly, there are many presentational ideas that can be applied to all kinds of other tricks, and there are many valuable lessons in showmanship that can be absorbed by watching Denis perform. Thirdly, these tricks are wonderful models of good magic design, in how the phases of a routine are well connected and build up. And finally, you might just find a few tricks that you will challenge yourself to learn, although advanced magicians are the ones most likely to be able to bring some of these routines into their own repertoire. I have no complaints here at all, although Denis does go through the material fairly quickly. Denis is a clear thinker, and it shows in how he teaches and explains his material. He also is careful to discuss the source of his ideas, and often produces the original books as part of his explanations. 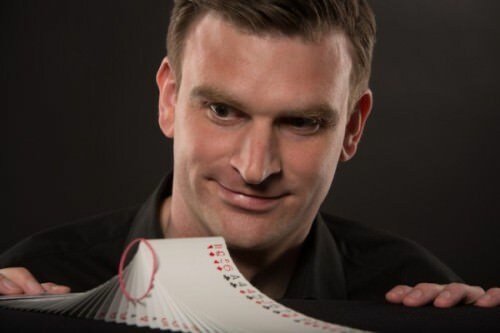 He makes the fair assumption that students of his video already have mastered the fundamentals of card handling, and focuses on the details of his handling and performance. Also very helpful is the attention he gives to resetting the deck at the end of many routines, making it possible to seamlessly move to a new effect that relies on a similar stack or memorized deck. Strong magic is a combination of different elements, including good design, good technical skills, and good showmanship. Denis really excels in all aspects of the craft of magic, and it's a real pleasure to watch him at work given his expert technical skills with cards, which is accompanied with engaging patter and many moments of warm humour.